9:40pm: This week is my first week of working a full-time job in a while. I'm instructing Tennis at the Quispamsis Tennis Club (rec center), and it's been great so far. 7:38pm: A couple years ago I met an employee of a water testing company located in Fredericton NB: "[the company's] primary objective is to provide the people of Atlantic Canada the essential service of Water Testing...". Basically, anyone can get their water tested by this company for a certain price; I think it may be around $40. Here's the link: InterMax. 6:16pm Today, Chelsi and I drove to Fredericton to pick up some of my things from Jeff's house. We just got back home. 10:49pm: This was another day of going to Quispam for Tennis work. Chelsi and I are back from Saint John Idol (thumbs down), and I'm just searching the internet. I just checked out CFMH 107.3fm and looked at the program schedule. Here's the link: |||||| I'm now listening to the Open Your Eyes show. 5:17pm: I just learned that Kid Rock is a huge douche-bag. 4:07pm: BACK ONLINE!!! Finally, Chelsi and I have the internet and cable TV in our apartment. 9:52pm: We're now back in Saint John, but our apartement has a very limited internet connection. I hope to be back online soon. Moving to Saint John tomorrow! Cecilia helped Chelsi and I pack the U-Haul, and we're off first thing in the morning. This afternoon, I spent some time outside of a conference in the city of Montreal. The conference was titled "Adapting to a New World Order". There were lots of people in business suits coming out of the building, and I snapped a picture of a limo on it's way out. I tried to go inside the conference room, but security said 'no'. 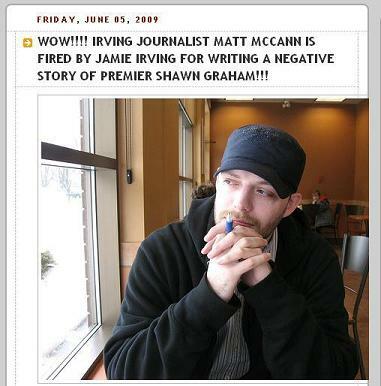 Charles explained that the full story of Matt Mcann will be covered by the CBC. 11:37am: added another chapter to 'Walden'.